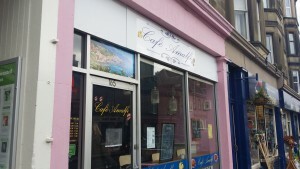 I’d spotted Cafe Amalfi on a couple of trips to Morningside market, which is held just across the road in the Merlin’s car park. When in the neighbourhood once more, although not on a market day, I popped in to give it a try. A compact little space with an emphasis on pinks and flowers, it is quite smart and has the feel of somewhere that’s popular with locals looking to relax, catch up with the events of day, and perhaps nibble on a slice of cake or a breakfast roll. The cafe was busy with only one table left. 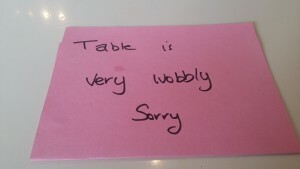 It had a note on it which read “table is very wobbly, sorry”. They were not wrong. I found it rather charming, and I always like a challenge to distract me from dripping soup down my tie. With a clear Italian influence, I’d sadly picked a day when they weren’t offering their small selection of pasta dishes, so instead I opted for soup and a panini. The soup of the day was lentil. It proved to be rather underseasoned, but that was easily rectified. Once sorted it was solidly decent version of this staple. My panini choice was mozzarella, ham and pesto. It was a notch better than the soup, but still in the realms of good rather than great. So overall, I’m not sure I caught Cafe Amalfi on its best day, as I suspect its pasta dishes might offer a better opportunity for the kitchen to display its skills. 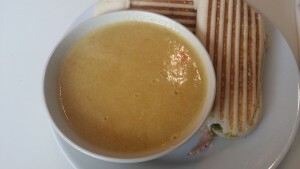 My soup and panini were OK but little beyond. I’ll give it another go some time, when I hope to find it on slightly better form.